Guardamar is a traditional Spanish town located in the Costa Blanca region, just north of Torrevieja. It is a town steeped in history and is also known as Guardamar del Segura. Popular with Spanish nationals and foreign expats, the town is very appealing to those seeking a change of scenery. It also has a good variety of different sights and activities to keep everyone happy. We’ve listed some of our favourites below! Guardamar has an amazing beach that seemingly stretches on for miles. It is in fact over 11km long and is separated into different zones with different names. Along its length you’ll find bright golden sands and crystal waters ideal for snorkelling, as well as vast sand dunes. Some areas have luxurious covered beach beds for rent, with nearby cocktail bars, so you can really enjoy it in style. For those seeking a quieter area, Moncayo beach will be the one for you. The main areas around the resort itself tend to get busier in summer, but thankfully it is large enough to accommodate everyone. Reina Sofia Park is a small urban public park located in the middle of Guardamar. It is beautifully maintained with lovely gardens and pond areas. Wildlife is in abundance, including all manner of local birds, as well as some turtles and flamboyant peacocks roaming the area. It’s great for those who want a bit of shade after spending all day at the beach, from which it is only a short walk away. It’s in a great location surrounded by local bars and cafes. Named after the former Monarch, the entrance to this natural park is just across the road from Reina Sofia Park, so you can visit both in a day. It brings a slice of wilderness to the urban area, with a huge swathe of untamed land. A vast area with several walking routes ranging up to 20km in length, you can traverse along boardwalks and well-maintained roads through varying areas of cacti, palm trees, ponds and sand dunes all the way down to the coast. This park is great for the outdoor type but can be a bit daunting for those used to more leisurely strolls. If that’s the case, why not consider hiring some bikes and cycling through at a brisker pace? It’s one of the best ways to see some untouched natural Spanish beauty without having to travel into the countryside. Just remember to bring some water and sunscreen if you plan on taking one of the longer walks. There is also a children’s playpark at the end of one of the trails if you decide to bring the whole family. Located on a rocky hill overlooking Guardamar, Castillo de Guardamar contains hundreds of years’ worth of history in its walls dating back to the 12th century. The main part of the fortress was destroyed during an earthquake in the 18th century, but the outside walls and foundations of the structure remain in place to this day. Those who decide to hike up the hill will be rewarded with fantastic panoramic views over the whole area, with the best to be discovered at dusk (or dawn, for the early-risers!). Some information boards also give detailed information on the castle’s past for all those history buffs. 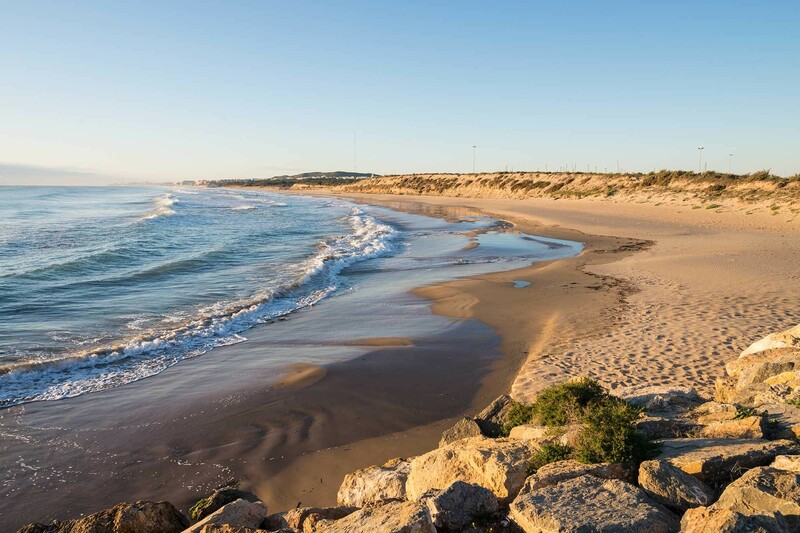 Torre la Mata is a quaint seaside village just south of Guardamar on the Costa Blanca. It is unusual among many other coastal developments, in that despite having many foreign nationals and expats, it has still retained its traditional Spanish charm and heritage. Visitors will find an area with quaint Mediterranean buildings, architecture, local shops and restaurants, without the high-rise apartment or hotel blocks that have sprung up elsewhere. The local beach is also beautiful, featuring plenty of space along its wide golden sands for all visitors. A stunning wooden promenade also features plenty of cafes and restaurants to enjoy some local food along your walk. These are just a few of our favourite places in and around Guardamar del Segura, but there are many more. It’s a fantastic location, and we’re always discovering more to do here. If you’re interested in visiting, we can arrange viewing trips from as little as £99, including return flights from the UK. Get in touch to discuss booking one today.